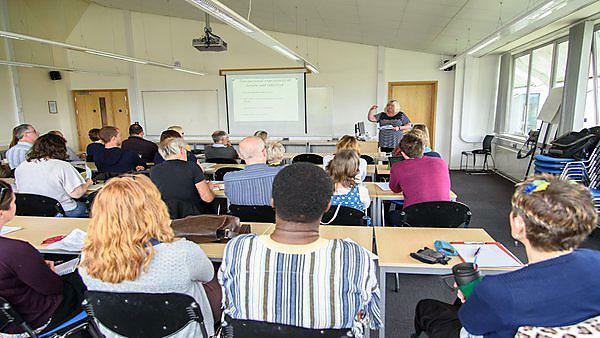 'R/Evolution: Research as Transformation’ was the theme of the fourth annual Institute of Health and Community/Plymouth Institute of Education postgraduate research conference. The theme for this conference drew attention to the transformative nature of postgraduate research – asking the question: what is the transformative potential of new knowledge upon our field of study, future practice and the future lives as researchers? These conferences provide an excellent opportunity for doctoral researchers to present work in progress, in different ways according to the stage of the research or aspect to be presented, and get feedback from peers and from a wider body of academic staff. The conference presentations were included in three thematic streams: methodological/theoretical issues in education; educational didactics and issues of inclusion and social justice. There were 27 oral presentations, round table discussions and poster presentations reflecting a wide variety of topics and methodological approaches. Students enrolled on both the taught professional doctorate (EdD) and the PhD programmes contributed to the day. The participants included full time and part-time students from the UK and from Saudi-Arabia, Spain, the USA, Ireland, China and Ghana. They included students from all phases of schooling, further and higher education and from both informal and formal education settings. Some students are just at the start of their studies and others close to completion. Dr Nick Pratt opened the conference and introduced the visiting speaker, Dr Joan Smith, Post Graduate Tutor for the EdD programme at University of Leicester. Joan’s keynote presentation ‘Becoming a resilient researcher; peer review, rationality and the transformative potential of critical friendship’ drew on her interest in improving pedagogy in doctoral research methods teaching and reported on her HEA funded research project ‘Developing doctoral students' critical writing skills through peer assessment’ (2014). The conference ended with a panel, chaired by Dr Joanna Haynes, on the theme ‘Transformation of researcher identities through networking, collaboration and engagement with professional, academic and wider communities’. Panel members included Drs Verity Campbell-Barr, Valerie Huggins, Louise Webber and Ciaran O’ Sullivan, who reflected on their varied experiences and had specific advice for those currently engaged in doctoral study. This was followed by questions and comments from the audience. The conference congratulated the first three students to successfully complete their EdD thesis.